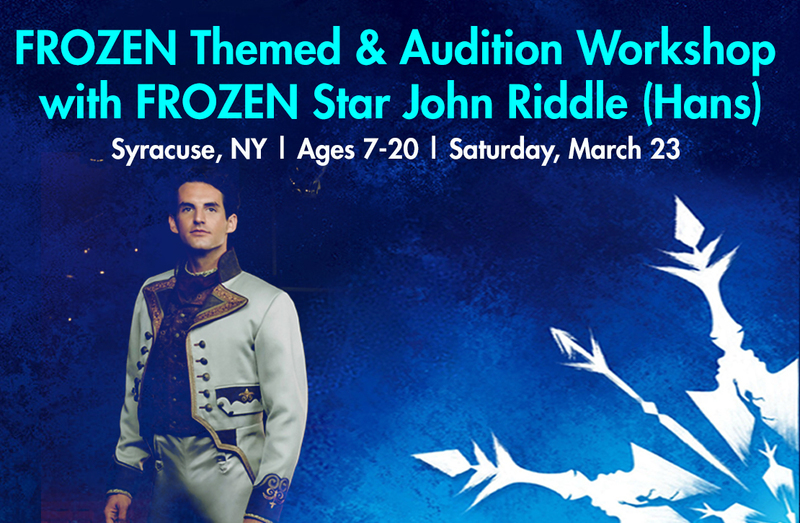 Join FROZEN star John Riddle (Prince Hans) for a musical theatre FROZEN themed workshop! Learn a song and dance combo with the star from FROZEN! After we learn a song and dance combo, participants will sing a 16 bar cut and the actor and music director will conduct mock auditions. Get feedback on your audition tech from John and the music director and learn how to snag a lead role in an amateur or professional production! Participate in a most riveting Q&A and bring your playbills because everyone will get a pic with the FROZEN star and a signed autograph! Don’t miss your chance to work with this Broadway Star of one of Broadway’s biggest hits! Time: 1:30 p.m. – 5:30 p.m.